You’re right, but I’m the boss! The kid wants a promotion after six months on the job! How did you react? Were you offended? Were you okay with the comment? Did you understand, or not understand, why someone would say these words? The words and your reaction, as well as the reactions of others, reflect generational differences in the workplace. There is a serious new problem in the workplace, and it has nothing to do with downsizing, global competition, pointy-haired bosses, stress or greed. Instead, it is the problem of distinct generations — the Veterans, the Baby Boomers, Gen X and Gen Y — working together and often colliding as their paths cross. 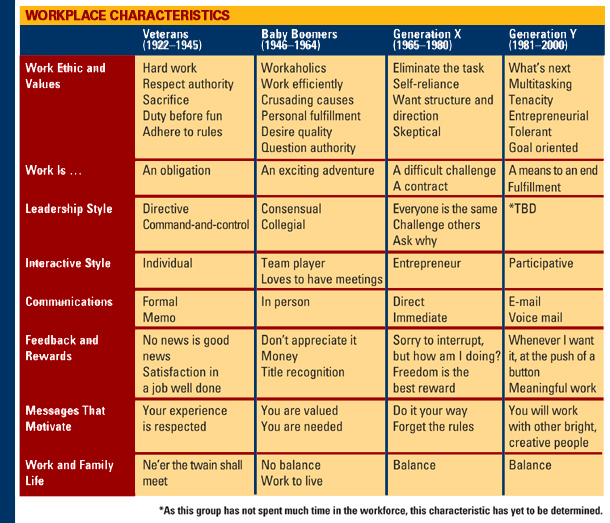 Individuals with different values, different ideas, different ways of getting things done and different ways of communicating in the workplace have always existed. So, why is this becoming a problem now? as to how the boss was treated and how younger workers treated older workers. No longer: Roles today are all over the place and the rules are being rewritten daily. At work, generational differences can affect everything, including recruiting, building teams, dealing with change, motivating, managing, and maintaining and increasing productivity. 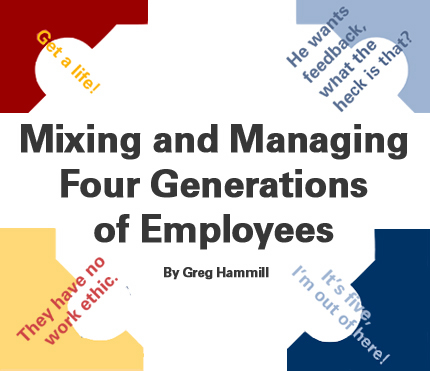 Think of how generational differences, relative to how people communicate, might affect misunderstandings, high employee turnover, difficulty in attracting employees and gaining employee commitment. Each generation has distinct attitudes, behaviors, expectations, habits and motivational buttons. Research indicates that people communicate based on their generational backgrounds. Each generation has distinct attitudes, behaviors, expectations, habits and motivational buttons. Learning how to communicate with the different generations can eliminate many major confrontations and misunderstandings in the workplace and the world of business. Whether at a family gathering or in the workplace, how do you manage intergenerational groups with conflicting work ethics, dissimilar values and idiosyncratic styles? How do you get them to stop snarling at each other? How do you motivate them to get along or work together? To begin to understand how individuals in different generations act and react, one must first start with understanding oneself. Begin by seeing where you fall on the “Generation Timeline” above. Since this timeline represents a conglomeration of many views, the starting and ending dates (birth years) of the generations are subjective, not scientific or fully agreed-on time spans. However, this subjectivity poses no real problems since the variation of years is not significant enough to impact the big picture of a generation’s description. 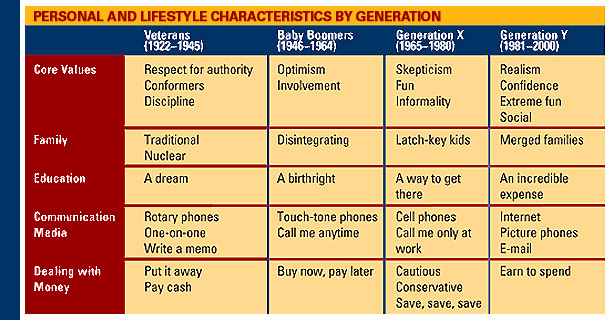 The first thing to consider is the individual and his or her underlying values, or personal and lifestyle characteristics, which seem to correspond with each generation, as shown in the following table. The characteristics listed in the table are but a very few of those that have been studied and reported by various authors. Not every person in a generation will share all of the various characteristics shown in this or the next table with others in the same generation. However, these examples are indicative of general patterns in the relationships between and among family members, friends and people in the workplace. Individuals born at one end of the date range or the other may see overlapping characteristics with the preceding or succeeding generation. From the above table, you can easily see why Generation X cannot understand what their grandparents mean by the traditional family or what fun it was to spend Christmas together as a family. Are you worried about the possibility of your Baby Boomer children being unable to retire or having to move in with you or their children as they reach the latter years of their lives? Possibly you should be. Do you now see why your view of education might differ from your children’s views? Do you understand why your children may not want to go to a movie with you? Can you see how generational issues, like what to do for entertainment, can create friction on those family vacations or at holiday get-togethers? Understanding these characteristics about individuals makes it easier to look at workplace characteristics and how they manifest themselves in business (see Workplace Characteristics below). An example, based on these traits, would be to think about how words are received differently. When a Boomer says to another Boomer, “We need to get the report done,” it is generally interpreted by the Boomer as an order, it must be done and done now. However, when a Boomer says to an Xer, “This needs to be done,” the Xer hears an observation, not a command, and may or may not do it immediately. With the above observations in mind, let’s look at a few work situations and how one might handle them. • At annual appraisal time, a manager from the Veterans generation gives out a nice bonus for a project well done. The Generation X employee is ungrateful and says, “Why didn’t I get this six months ago, when the project was completed?” Gen X wants instant gratification, whereas a person in the Veterans generation is happy to get money anytime. The solution here may be for the company to explore reward plans geared to the different generations, or things like monetary rewards and recognition given at the time when it is earned. • A Generation X manager tells a Boomer he has been working too hard and should take time off to take the family on vacation. Instead of saying thanks, the Boomer replies, “I work to get ahead, to get a promotion, not for a vacation.” The next time that situation comes up, the manager might elect to give this particular employee a bonus, rather than suggest a vacation. • A top-notch, cross-functional team with individuals from several different generations has been set up to recommend a solution to a nasty manufacturing problem. After a couple of weeks, the manager responsible for the team cannot understand why there is constant bickering and nothing is getting done. If the manager were aware of just one characteristic of each individual relating to communication needs, he or she might understand the stalemate. The Veterans on the team are looking for handwritten notes and direct, specific requests for work to be done. The Boomers do not like to work independently, and they expect to have meetings any time, any place — and it is fine if they are called day or night. Xers do not want to hear about the project outside of work, and don’t dare call them at home. And the Yers don’t want any meetings at all, they only communicate via voice mail and e-mail. Is it any wonder that the team is having trouble getting motivated toward the goal? At the beginning of any team formation, an effective leader should consider spending time learning how team members wish to communicate. • A Boomer is working for a Generation Y individual, and there is nothing but animosity between the two. Why? Generation Y individuals, born since 1980, have many of the traits of the Veterans. They are not like their parents. They are curious, goal-oriented and loyal. Solution, consider having Boomers work for Veterans rather than Gen Ys. There are more pronounced differences between the generations today than ever before. What can one expect with the dramatic changes in our world in the last 60 years? Being aware of these differences can help individuals tailor their message for maximum effect, regardless of the task, or the relationship — family, friends, workplace peers. Good business is based on understanding others. The majority of us think the correct way, and the only way, is our way. In business, as well as in personal life, that is just not true. To work effectively and efficiently, to increase productivity and quality, one needs to understand generational characteristics and learn how to use them effectively in dealing with each individual. Karp, Hank; Fuller, Connie; Sirias, Danilo. Bridging the Boomer Xer Gap: Creating Authentic Teams for High Performance at Work. Palo Alto, Calif.: Davies-Black Publishing, 2002. Kersten, Denise. “Today’s Generations Face New Communications Gap,” USA Today, November 15, 2002. Lancaster, Lynne C.; Stillman, David. When Generations Collide: Who They Are, Why They Clash, How to Solve the Generational Puzzle at Work. HarperCollins Publishers Inc., 2002. Sago, Brad. “Uncommon Threads: Mending the Generation Gap at Work,” Executive Update, July 2000. Walston, Sandra Ford. Distinguishing Communication Approaches Across Generations, 1999 (online publication), http://www.walstoncourage.com/pages/articles/generation.htm. Zemke, Ron; Raines, Claire; Filipczak, Bob. Generations at Work: Managing the Clash of Veterans, Boomers, Xers, and Nexters in Your Workplace. New York, N.Y.: American Management Association, 2000.